Apparently, some people thought the Grand Prix was boring. That may have been true had you come for the overtaking (there was none) but then we knew that about Monaco anyway. How fair is it to say that it's impossible to pass at Monaco and then complain when there isn't any? We watch because it's a magnificent Grand Prix and if, as often happens, the race turns out to be close and hard fought, that is a bonus. This was not one of those, as hardly anyone ran into problems and even the pitstops failed to shake up the order, apart from allowing Kubica to get ahead of his BMW teamate, Heidfeld. But the race was as spectacular as ever, the sight of the dominant McLarens sliding impatiently through the corners alone well worth the silliness of the pre-race grid walks by TV front men. 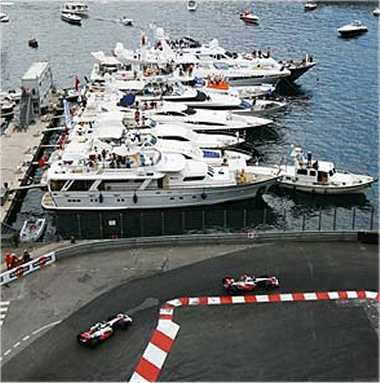 Send F1 cars barreling through the narrow streets of any city as pretty as Monaco and the sight is enough to bring us back year after year. There were many points of interest for those in the know, as well. Fisichella's lonely but valiant drive to fourth was a welcome suggestion that Renault is returning to form, just as the Toyota team's miserable failure to impress yet again, coupled with their customer team, Williams, once again showing how it's done, must surely mean a re-think for the Japanese company. And once again I must mention Scott Speed, his faultless drive to ninth spot demonstrating that Red Bull (even in its Italian variant) has the potential to reach the parts that other energy drinks cannot - provided you hold the can steady and don't get into arguments with the barriers or other drivers. Tenth fastest race lap was not a bad effort at all. After the race the inevitable media frenzy exploded, with accusations of team orders at McLaren multiplying as the hacks realized that their dreams and predictions were unfulfilled, Lewis Hamilton in only second place and yet to win his first GP. Even Lewis himself seemed to be caught up in the storm, allowing some apparently disgruntled words to invade his normally cheerful public statements. Ron Dennis tried hard to point out the importance of strategy at this race but no-one was listening; if the new boy wonder had not been allowed to race his best, the accusations must flow. I must have been watching a different race. Like most GPs at Monaco, the fight for the lead ended at the first corner, after Hamilton had tucked in behind Alonso at the start and then stayed there, aware that any move could allow others to take his slot. It looked like the perfect team maneuver, second man covering pole man's rear, riding shotgun in effect, and my estimation of Lewis went up as a result. After that, it was all over, barring some shenanigans in the pitstops - and this is where the criticism focused, it being obvious that Alonso had the measure of the young Brit at this track. Unfair to handicap Lewis with extra fuel, went the cry, but hey, one of them had to have more than the other and it made sense to put the man in front on a lighter load. McLaren is a team, after all, and not a British hero benefit party. Italian commentator to Giorgio Piola (another unbiased one): "Giorgio, that long wheelbase really did affect the Ferraris at Monaco, didn't it." Piola: "Don't kid yourself. Ferrari have much more serious problems than just the wheelbase of their cars." Immediately we suspect some defect in the cars or the team but is it possible that the man was referring to their rather more obvious problem of getting only one driver into a winning position? I think the Ferraris will be back to their highly competitive ways in Canada and all thoughts of a McLaren walkover this season will evaporate at the same time.